Powers/Abilities: Arlinna was a normal human who engaged in illegal activities but was somewhat inept at them. She scared easily. (Conan the Barbarian I#42 (fb) - BTS) - Originally from Nemedia, Arlinna fled Shadizar after witnessing the murder of the Khitan ambassador to the Zamorian court. (Conan the Barbarian I#42) - Now in the City of Thieves, Conan saw Arlinna's head in the window of a nearby tavern. Unbeknown to him, Arlinna was being blackmailed by Baron Takkim to steal the Dragon-Head of Koblar-Zann from the merchant Lun-Faar. Takkim believed that a woman's charms might succeed in robbing Lun-Faar where force and sorcery had not. He told Arlinna to pose as Lady Asqueth, a collector of relics, and gave her an amulet as an identity tag plus sleep pellets for the merchant. As she left via a back entrance, she was accosted by Armand, Brutos and Womar, who sought to steal her amulet. Conan suddenly arrived and easily overpowered the thieves. Conan then accompanied Arlinna into the bazaar where she saw him use his strength to knockout a wrestler called Krono and earn some gold. They spent the rest of the day together drinking and gambling but ended up back at Conan's rented room where the drunk Cimmerian became amorous with Arlinna until she knocked him out with a nearby amphora and escaped to Lun-Faar's shop. Arriving at the merchant's shop, she passed herself off as Lady Asqueth and asked to see the dragon-head. Slightly suspicious, he invited her further into his shop, passing Tavashtri, immobile like a statue, plus small figurines of frozen thieves. He showed her the dragon-head and stated that it would give the bearer eternal life. When Lun-Faar left to get some tea, she snatched the dragon-head and sought to run away but was stopped by bars that suddenly blocked the doorway. Lun-Faar then tortured the woman for the man behind the scheme. Arlinna left and wanted to jump off a building to die but was stopped by Conan, who had since recovered. She recounted her mission and Conan decided to help her as she went to Baron Takkim to report of her failure. Just as the Baron was about to lethally punish her, Tavashtri, whom Lun-Faar had sent to slay the planner of the crime, burst in. Conan then also rushed in and battled the demon while Arlinna cowered in a corner. 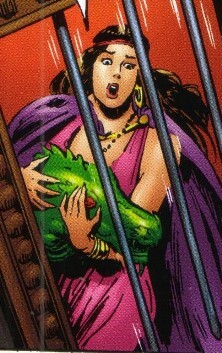 Tavashtri then flew away and Arlinna left to tend to Conan's wounds. Comments: Created by Roy Thomas (writer/editor), John Buscema (pencils) and Ernie Chua (inks). This story was "freely adapted" from "The Purple Heart of Erlik"by Robert E. Howard, Conan's creator, in 1936 in Spicy Adventures, but it was not a Conan story. The images used in this profile are from Marvel comics that have since been reprinted and recolored in a TPB published by Dark Horse. Any help in replacing these images with the original colored panels would be greatly appreciated! Armand, dwarfish in stature, along with Brutos and Womar (whom he called brothers), tried to rob Arlinna of her false amulet and commanded the other two to take the prize. After the other two were soundly defeated by Conan, he fiercely bit Conan's leg but was then lifted up and hooked up on a wall by Conan, who nevertheless admired his courage. Brutos of the Weak Mind, along with Armand and Womar, tried to rob Arlinna of her false amulet but savagely knocked out with a single blow from Conan. Krono was a large and powerful street-wrestler who engaged in bouts in the bazaar with anyone who could survive two minutes fighting him winning some gold coins. His strength was close to Conan's, but he was no match for Conan's fighting skills. Conan took up the challenge, quickly knocking Krono out, showing Arlinna Conan's strength. Baron Takkim was a treacherous and murderous man who used others to complete nefarious tasks for him. He blackmailed Arlinna into stealing the fabled Dragon-Head of Koblar-Zann from Lun-Faar, giving her false identification, and sought to strangle her for her failure. However, he was instead slain by Tavashtri, the demon sent by Lun-Faar. Womar of the Single Eye, along with Armand and Brutos, tried to rob Arlinna of her false amulet but was rammed unconscious against a wall by Conan.